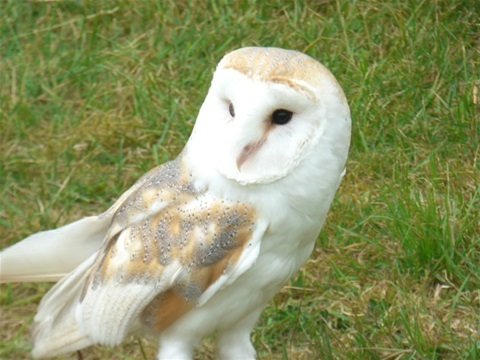 Mr Tyto lived with his wife in an old derelict farmhouse near the home for waifs and strays. They were happy barn owls until one day a storm came and Mr Tyto went missing. Mrs Tyto was very upset and kept peeping out the broken roof to see if he was coming home. But all Mrs Tyto saw was flashes of light across the sky and big fat drops of rain fell on her face. ‘Oh I wish he hadn’t gone hunting on a night like this,’ she cried and turned to look at her four babies huddled together in the corner of the nest. Their white heart shaped faces peered up at her. They needed feeding but the cupboard was bare. The little barn owls began to make hissing and chittering sounds as they talked to each other. They never hooted like the tawny owls. ‘Keep the noise down!’ said their mother. But they were tired and hungry and soon began to squabble. With each flash of lightening and each roll of thunder, Mrs Tyto shivered and wished the storm would end. Meanwhile, not very far away, Mr Tyto was sheltering in the garden of the home for waifs and strays. There was no way to get a message to his wife, informing her that he was safe and well, so he pulled a wing over his head and tried to get some sleep. It was a long night for both Mr and Mrs Tyto. The hungry and exhausted babies slept, which was a great relief for their mother. As if by magic, the storm passed and Mrs Tyto stretched open her wings to greet the sun. Just as she was about to close them, she saw her husband flying silently home and she almost cried. Well she would have cried had it not been for her hissing babies. So she laughed instead as Mr Tyto wrapped his wings around them all.